I like potato chips, but I loooove zucchini chips...especially when the zucchini being used comes right from my very own garden. You can't fully comprehend the sense of pride and accomplishment you get from eating foods that you've nurtured from seed to maturity until you do it yourself. I know some folks just don't have the right circumstances to have their own garden even if the desire is there, but if you're lucky enough to have some space in the sun and a little extra time, I urge you to buy a few pots, a bag or two of soil and compost, and some seeds and just take a stab at gardening. If I can do it, it can be done by you! Now that I've said my piece about the gloriousness of gardening, I'll step off the grandstand and talk to you about these chips. They're simply slices of zucchini wearing a coat of breadcrumbs, seasonings, and Parmesan cheese and baked until brown and crunchy. Easy, nutritious, delicious, inexpensive, colorful, satisfying, and the list of positive attributes goes on. We had them as a side for this chicken with pecans, so the crunch factor for the meal was nearly off the charts. Three mistakes to avoid, which I have generously already done for you to prove that they're disastrous, are cutting the zucchinis too thinly, over-salting, and having the oven temperature too high. My first batch resulted in tiny, shriveled, mostly-burned-to-a-crisp remnants of some once-magnificent zucchini. Be careful with your salt because its impact magically seems to intensify as the zucchini dehydrates. The silver-ish lining of my failed attempt is that I was working with supermarket zucchini and not the fruits vegetables of my own labor. Combine the first 5 ingredients in a medium bowl, stirring with a whisk. Pour the milk into a shallow bowl. Dip the zucchini slices into the milk, then dredge in breadcrumb mixture, coating each side thoroughly. Place coated slices on a baking sheet line with parchment paper and bake for 30 minutes or until browned and crisp. Check often, as the thickness of your slices matters a lot! This looks like a yummy dinnertime treat! I have had zucchini chips in restaurants (similar to potato chips), but this looks much, much more interesting and fun. Reminds me a bit of eggplant parmesan. Looks good to me and lucky you with having your own zucchini. We have way too much shade in the yard now for a garden and I miss it. I love zucchini chips! We've had no luck at all growing them, so I just have to envy yours. These not only look yummy, they sound healthy too. A great side dish, or on their own as munchies! I am too a fan of zucchini chips! These look really crispy and delicious, Grace. First of all I love fried zucchinis and we make them here all the time during summer. Second now how great is to have your own home grown ones! They look so crispy and delicious,Grace!I am bad gardener :) I would love to grow my own vegetables! wow! I've never tried one! Looks so yummy! Hope you have a great week! I would definitely choose these zucchini chips over potato chips! Love the crunch. I love zucchini!! These look delicious!!! 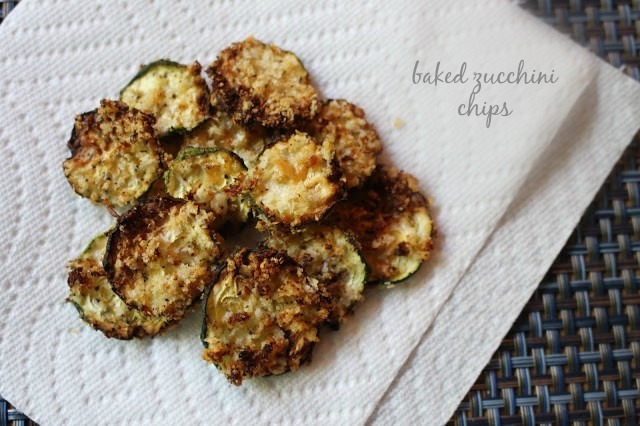 Zucchini chips - what an amazing idea! This is a fun way to serve a vegetable that always seems to be around. Love that these are fancied up with the breadcrumbs, cheese, etc. (versus the plainer salted veggies chips)! And you can never have too many zucchini recipes!